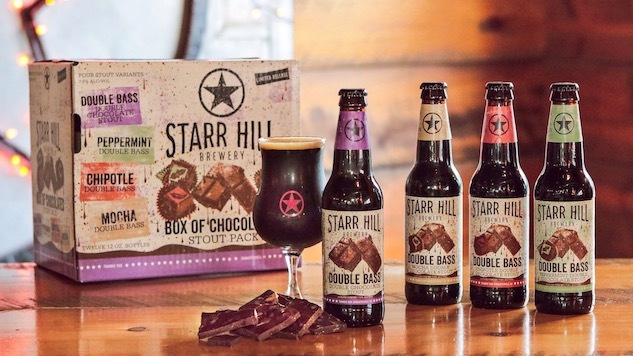 Virginia-based Starr Hill has been around just short of forever, and has managed to reinvigorate their lineup in the last couple of years, remaking recipes for their flagships and introducing new limited-edition beers at a serious clip. And we like the cut of their jib. Their new double IPA impressed the hell out of us not that long ago, and their coffee stout, Little Red RooStarr, earned the number six spot in our most recent blind tasting of non-imperial stouts, beating 60 other stouts in the process. So, I was psyched when they sent us beers from their new variety pack, Box of Chocolates. In this giant box of beers, you get a couple of Double Bass Double Chocolate Stouts and then three variants of that base beer—a peppermint version, mocha version and a chipotle version. Double Bass itself was a new beer for 2017, introduced last January. It’s billed as an imperial, but comes in at a relatively demure 7.8%. As for the variants, Starr Hill uses all natural ingredients for the infusions: organic peppermint leaves, smoke-dried jalapeno peppers and locally roasted whole coffee beans. Put it all together, and you have the perfect variety pack for the holidays. This is the first time I had the chance to taste this stout, and it took me a while to work up the courage to give it a go. The chocolate stout is a tricky thing that, in my opinion, often falls into the “saccharine” category of beers. I like chocolate and I like beer, but I don’t like drinking chocolate syrup that tastes like beer. Fortunately, Double Bass falls on the “restrained” side of chocolate stouts. It smells like milk chocolate, blunt and faintly sweet and milky. It’s not as sweet as you think it’s gonna be from the label, which is a success all on its own. It has a round, full mouthfeel without being thick and syrupy. While it’s not overly sweet, there’s nothing bitter or roasted about this beer either. It’s smooth, and easy drinking, but I expected another layer to jump into the mix to offer some sort of complexity. That layer never arrives, so the beer comes off as a bit one note, but it’s a great note, and maybe that’s what makes Double Bass a great base beer for experimentation. Here’s where the beer gets a bit more complex. Starr Hill added locally roasted coffee to the mix and the result is more interesting than the base beer. The nose offers a roasted note, while the chocolate takes a back seat on the sip as the coffee steps forward. It still has a milky, round mouthfeel, but there’s an edge to it all, with some bitterness and roasted character coming in from the coffee. It’s more balanced and complex than the base stout, and this is exactly what I asked for when I was drinking the original Double Bass. But I actually prefer the original Double Bass to this Mocha version. I know; humans are complex and sometimes we don’t like it when we get exactly what we ask for. Double Bass Mocha Stout is a fine beer, but it’s nothing compared to the smooth, rich Little Red RooStarr coffee stout that did so well in the blind tasting. Oh, peppermint and chocolate. This is one combination that I’ve never been able to understand. I understand that this puts me in the minority, so I’ll put my feelings aside and carry on with the tasting. Double Bass Peppermint is noticeably different right out of the gate, smelling like a Peppermint Patty, or Andes Crème de Menthe Thins. The nose is a pretty solid indication as to what’s to come out of the bottle, because this beer tastes exactly like someone dropped an Andes thin into a stout. There’s the milky mouthfeel followed immediately by a refreshing wave of mint. That cool element from the mint sticks around on your tongue after the sip is gone, exactly like when you’re sucking on a peppermint. It’s cold and tingly. If you dig Andes mints, you’re gonna dig this beer. If not, move along. The peppermint is strong with this one. Starr Hill sent Double Bass Chipotle into the blind tasting of non-imperial stout, but it didn’t make it into the This beer didn’t make it into the top 20 of that ranking. But here’s the thing: I really like it. The peppers play a big role, adding a layer of smokiness and heat to the sip that lingers long after you’re done. It’s the kind of heat that intensifies the more you dig into the bottle, but it’s also the kind of heat that’s a little addicting, so you want to keep digging into the bottle. There’s still plenty of milk chocolate, which comes out to play on the forefront of each sip, cooling your palate as you take one drink after the other. But then it’s solid, roasted hot peppers. I’m not saying this beer reaches “novelty” heat levels. That’s not the case at all. The spiciness is pretty mellow compared to some other pepper beers out there (Habanero Sculpin comes to mind). But there’s no mistaking that there are peppers in this beer. And I like that. So, this is the variant that I feel successfully provides the right amount of complexity and balance to the base beer.